Ralph Hall of Swan Bank Works, Tunstall, Staffordshire was in business 1822 to 1849 and was the first to introduce Asiatic Pheasants pattern, probably about 1830. It was a finely engraved design and there was variation across the different printing plates, used for the various items made. Pieces by Hall are rarely found today and it seems to have been mainly produced in black, as here. 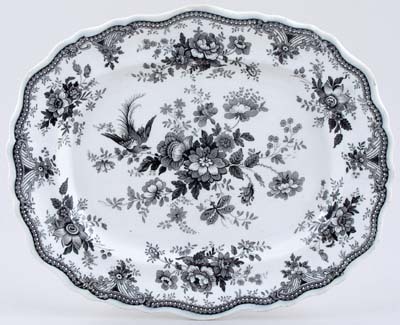 It is a lovely wavy rim platter printed in a crisp, clear black. This is a quality early 19th century platter, quite superior to what came later in this design. Printed in a clear crisp black. Backstamp: HALL impressed with 9 below and black printed typical floral cartouche with Asiatic Pheasants in a ribbon and R Hall beneath. A few signs of wear around rim including four minor nibbles to rim and small chip behind rim. Generally excellent condition with sound glaze.